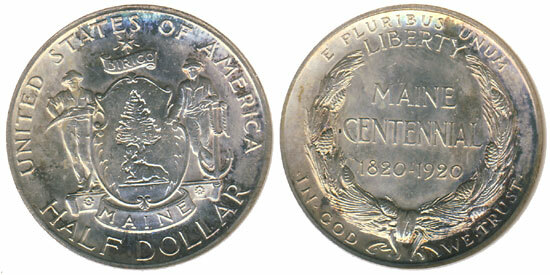 The last silver dollar struck for circulation in 90% silver was the Peace Dollar. It was produced from 1921 through 1935 and again in 1965 (dated 1964) although surviving examples of the last date are unknown to exist and in fact illegal to own. Anthony de Francisci, an Italian born sculptor who had come to the United States with his family when he was eight years old, designed the coin. In this article we will take a look at the life and some of the other works of this man, one of several early 20th century engravers who changed the face of American coinage. 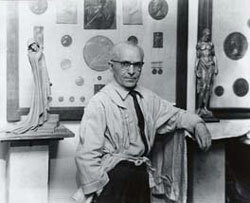 Antonio de Francisci was born on July 13, 1887 in Palermo, Italy, the capital city of Sicily. His father was a marble cutter, with which Anthony had assisted him as a child. In 1895 he moved to the United States but he wouldn’t become a naturalized citizen until he was 26, in 1913. At that moment he attended Cooper Union in Manhattan, where he studied under James Earle Fraser, who had just designed the new Buffalo Nickel. Fraser would not be the only designer of American coinage that Francisci would assist in the early years of his career. 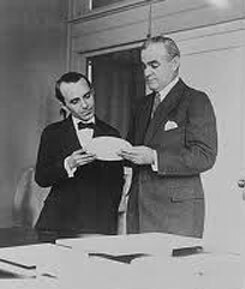 Both Adolph A. Weinman and Hermon MacNeil would also enjoy the assistance of the Italian. One of the earliest known works by de Francisci is a portrait plaque of Alexander Weinman, made in 1915. It features a standing portrait of Weinman against a plain field, based on a 1912 photo. The plaque reads at the bottom in two lines: “ADOLPH ALEXANDER WEINMAN” / HIS PVPIL ANTHONY DE FRANCISCI FECIT”, with fecit being a Latin world meaning “made by” or “made this”. The use of the V instead of the U in “pupil” would be something that de Francisci would continue to use, including on his design for the Peace Dollar. Shortly after attending Cooper Union, de Francisci would find himself as an instructor of the prestigious Columbia University in New York. De Francisci never left the city, and a few short years later he opened his own workshop in the city that never sleeps. Soon afterwards he was employed by the United States Mint to make models of drawings meant for potential new coinage, a job he could no doubt thank to his early contacts at the Mint. In 1920, less than a decade after enrolling into Cooper Union, he would design his first coin to critical acclaim, the Maine Centennial Commemorative Half Dollar. The aforementioned Peace Dollar would be introduced in 1921 to replace the Morgan Dollar, which had been first struck in 1878. Even though no silver dollars were struck between 1905 and 1920 the denomination would be struck again in 1921, using the old Morgan Silver Dollar design before switching to de Francisci’s Peace Dollar design. His design had been chosen out of eight possible designs by other sculptors, including MacNeil and Weinman. The Peace Dollar design was chosen in a competition that had been organized by the Commission of Fine Arts, a method by which many coin designs of the early 20th century were chosen. The other contestants were Victor D. Brenner (who designed the Lincoln Cent in 1909), Chester Beach, John Flanagan, Henry Hering, Robert Aitken and Robert Tait McKenzie, all of whom lived in New York City. Of the eight, de Francisci was the youngest and was generally considered an outsider with the least experience. For his design, for which de Francisci received a grand prize of $1,500 (the other contestants each received $100), he used his wife Teresa Cafarelli de Francisci to represent Liberty on the obverse. Teresa was born near Naples, Italy in 1898, and had immigrated to the United States with her mother in 1902. Teresa and Anthony married in 1920 and would have one daughter, Gilda. De Francisci himself called the portrait of his wife on the Peace Dollar as “a composite face and in that way signifies something of America…something of the spirit of the country”. After de Francisci designed the Maine Centennial Commemorative Half Dollar and the Peace Dollar, he would not design any other coins. His career, however, was far from over. Among his most famous works of art is the so-called “ruptured duck”, also known as the Honorable Service Lapel Button. It was awarded to servicemen who had been honorably discharged from service in World War II. Since servicemen stationed overseas were not allowed to possess civilian clothing (meant to make desertion more difficult) the button allowed servicemen returning home to continue to wear their military uniform after having been discharged. The button’s design featured an eagle with its wings spread inside a circle. Because of it’s appearance it became known as a “duck” and since the people who received it were about to leave the military it would eventually become known as the “ruptured duck”. One of the last numismatic items that de Francisci designed was the inaugural medal for the 1964/65 World’s Fair held in New York City. 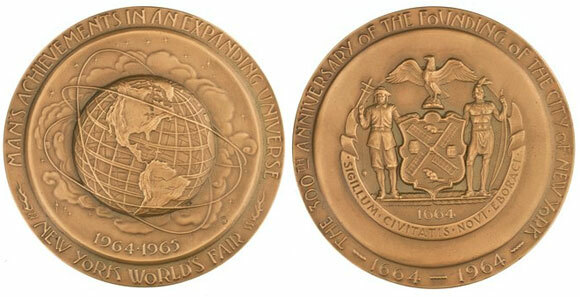 The obverse featured a globe, encircled by a number of lines representing the paths of satellites, with the text “MAN’S ACHIEVEMENTS IN AN EXPANDING UNIVERSE / NEW YORK WORLD’S FAIR”. The reverse featured the coat of arms of the city of New York, the text “300TH ANNIVERSARY OF THE FOUNDING OF THE CITY OF NEW YORK” and the dual dates 1664-1964. The medal was sold at the fair struck in white metal and enclosed in a small plastic case. They are generally available for a few dollars although examples struck in other metals (such as sterling silver) are noticeably more difficult to find. Other medals that Francisci designed included a 1935 medal for the Society of Medalists, the Texas Ranger Congressional Medal, and two medals for the Hall of Fame of Great Americans medal series. 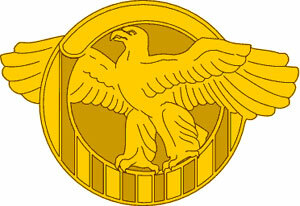 He also designed the National Guard Bureau Insignia. Anthony de Francisci passed away on October 20, 1964. The Peace Dollar will make us forever remember the man, as do the medals he designed. His wife Teresa would live until the age of 92, passing away on the same date as her husband in 1990. She would be the witness of an increasing interest in the coins her husband designed, and to this date the Peace Dollar is a popular series that continues to attract the attention of collectors. 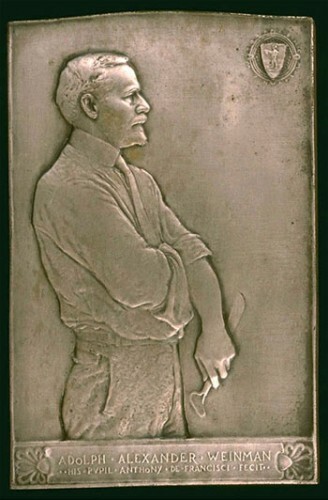 The medals he designed are also important artifacts that show the talent of this (in the author’s opinion) underappreciated engraver, and are welcome additions to any Peace Dollar collection as they show how the style of de Francisci developed in the years after the first Peace Dollar came off the press. Why 1964 Peace Dollar is illegal to own? So why not president or congress reverse this law to make it legal to own 1964 Peace Dollar? I always enjoyed the work of Anthony de Francisci. In my collection is a BU Maine Centennial Half Dollar, 1921 Peace Dollar, and a large bronze version of the 1964-5 World’s Fair that I bought while at the fair with my parents. All cherished items to me! The only way to own a 1964 Peace dollar was to exchange it with a “normal” Peace dollar prior to melting (illegal) or according to the rumor mint employees were allowed to exchange them legally but were instructed to bring them back, which then made them illegal to own. The destruction was so through that they even destroyed test pieces discovered in 1970. Based on a discovered illegally obtained 1933 gold Eagle initially Uncle Sam would split the proceeds, with the owner, because the owner was able to claim he obtained the coin legally from someone who obtained the coin legally but simply never returned it. This brought up speculation that a 1964 Peace dollar would appear, but the last time someone tried to pull that number with the 1933 gold coins the government simply confiscated the coins as stolen, because their was no leeway to the fact that the person obtained them via theft, so no sane person would admit to owning a 1964 Peace Dollar. What about the “Test Samples” for the 1921 Peace Dollar? As an artist, I know that the first samples that are produced from a die or mold, these test samples are made to inspect the details and quality of the die or mold (especially if it is a new design). I know that Anthony, once he finished the first die, he used soft refuge, residue materials to verify the die’s details and it had to be a non-essentially soft material in order not to produce damage to the first dies. I heard it said, from very reliable sources, that sometimes small pieces of other soft metals were used that were pieces of residue to create a planchard-like surface/size in order to test their die detail, under lower pressure, before the proofs were made. why did Anthony de Francisci use a v for the ltr. u on the obverse of the Peace dollar, and then use the ltr. u on the reverse in the two instances. Also, he uses a small o and a cap. D in God on the obverse. Were these choices ever questioned at the time, and if so what was the outcome?